To order the nanoKeyer sourcing service please follow the instructions below. 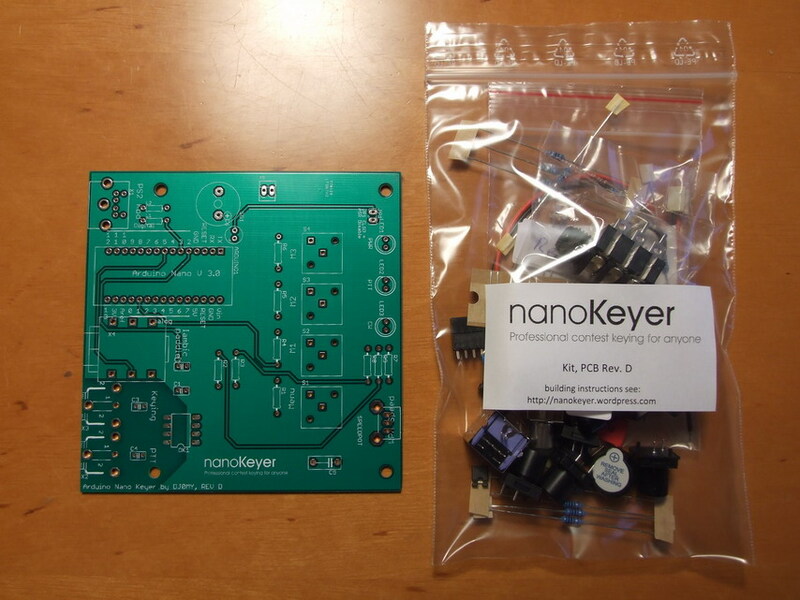 nanoKeyer is an open source hardware based on the free K3NG open source firmware. Since it is open hardware everyone can make copies of the nanoKeyer for personal use (commercial use is prohibited). See the Gerber CAM files for PCB manufacturing and building instructions (incl. BOM and schematics) in the Download section. As a special service I am offering here a “Sourcing Service” so that you do not need to search for the parts and do not need to etch your own PCB. You could also consider it a group purchase, although I would try to keep a decent buffer stock. In order to keep the cost low the completed keyer PCB can be built into an enclosure of our choice and is therefore not included. The sourcing service fee is 44 EUR per nanoKeyer parts kit. This fee includes a global air mail shipping flatrate – no matter where you live. 4. You are not buying a commercial product, but order a parts sourcing service from me. I would like to apologize for this, but due to experiences with previous buyers I had to introduce this confirmation step. If parts are out of stock you will be notified during the order process. You do not need a Paypal account – you can also pay as a guest! The nanoKeyer PCB will need one Arduino Nano V3.0 (ATmega 328) or compatible plug-in board in order to work. Without the Arduino it is not possible to use the nanoKeyer PCB as a functional keyer. The Arduino Nano can be easily programmed via the USB cable (no expensive programmers needed !) with the K3NG Keyer Firmware preconfigured for nanoKeyer which you can find in the download section of this site. The cheapest way is to get an Arduino Nano from one of the vaious dealers on ebay. Hint: Try to see if you can get a version still using FTDI USB serial chip. Since approx 2015 the majority of Chinese Arduino Nano clones use the new Chinese CH340 serial converter chip, so the FTDI versions are more and more difficult to find. It is reported that the CH340 versions also work, but may require manual serial driver installation, since Windows Update servers may not automatically detect these chip.